Affinity @Serangoon by Oxley - Selling Fast! Just 350m to upcoming CRL Station. Direct Pricing, Ebrochure and Floor Plan Download. Affinity is an upcoming development along Serangoon North Avenue 1 by Oxley Holdings featuring 1012 Apartments, 40 Units of Strata Landed House as well as 5 units of Commercial. Affinity at Serangoon is approximately 1.4km away from Serangoon MRT Interchange Station. There are bus services just outside the development which will seamlessly link the future residents of Affinity at Serangoon to the Serangoon Bus Interchange which is just next to the MRT Station. The station operates 2 MRT Lines i.e. the MRT North East Line and also the MRT Circle Line. By using the Circle Line, future residents of Affinity at Serangoon just need to travel 2 stations to the arrive at the Bishan MRT Interchange Station where the MRT North South Line is readily available at the station. Future residents taking the MRT North East Line just need to travel 5 stations towards Harbourfront MRT Terminus direction to arrive at the Little India MRT Interchange Station where the MRT Downtown Line is available for transit. It is just 6 stations to arrive at the Dhoby Ghaut MRT Interchange Station which is located at Orchard Road. For those driving, it will take approximately 20 minutes of driving to reach the Central Business District (CBD). Those who prefer to drive down to the main Orchard Shopping Area for a weekend shopping trip will just need to take them approximately 15 minutes’ time. Affinity at Serangoon is also near to the Central Expressway (CTE) which can interlink drivers to other major expressways such as the Pan Island Expressway (PIE), the Tampines Expressway (TPE) and also the Seletar Expressway (SLE). The purchase price for Serangoon Ville at S$499 million works out to a land price of close to S$835 per square foot per plot ratio (psf ppr). This is lower than that of The Garden Residences at S$965 psf ppr, which is situated on the next plot of land at Serangoon North Avenue released under Government Land Sales. The estimated break even price will be in the range of S$1,300 and therefore the estimated selling price will be likely be above S$1,500 psf. KSH Holdings Limited (“KSH” or the “Group”) (“金成兴控股有限公司”) is a well-established Construction, Property Development and Property Investment group that was incorporated in 1979 and has been listed on the Mainboard of the SGX-ST since February 8, 2007. Through strategic alliances and joint ventures, KSH’s property development and investment presence spans across various real estate sectors including residential, commercial, hospitality, and mixed-use developments. Apart from having successfully executed residential and mixed-use development projects in Singapore and the People’s Republic of China (“PRC”), it has jointly acquired properties in other geographies including the United Kingdom, Australia, Malaysia and Japan. It will continue to explore opportunities in new geographies with favourable real estate cycles with a focus on Southeast Asia. As a boutique property developer, the Group has a niche focus on developing distinctive and high quality residential properties in Singapore’s choice districts. Among its completed projects are DLV at Dalvey Road, The Element@Stevens at Steven Road, detached and semi-detached houses along Holland Road, as well as a joint-venture project, The Lumos at Leonie Hill. Heeton’s growth in the property industry is underpinned by a stable portfolio of investment properties that includes Tampines Mart, The Woodgrove, Sun Plaza and El Centro. The Group has also ventured into the hospitality sector, via a significant stake in Mercure Hotel, located in the popular tourist destination of Pattaya, Thailand. There is no lack of shopping and entertainment options as Hougang One, Hougang Green Shopping Centre. Greenwich V, Heartland Mall, myVillage at Serangoon Garden and Hougang Mall are just short drives away. Food lovers will be thrilled by the variety of authentic local food at Chomp Chomp Food Centre and the Serangoon Gardens food enclave. Residents looking to unwind over lifestyle activities outdoor can do so at Hougang Sports Hall, Serangoon Gardens Country Club, Kovan Sports Centre and Hougang Stadium. Families would also be pleased to note the variety of good schools in the area, including Rosyth School and Zhonghua School which are within 1KM. The academic journey of a child from pre-school to higher education would be well covered here, St. Vincent De Paul Kindergarten, Xinmin Primary and Secondary School, Nanyang Polytechnic and Serangoon JC. 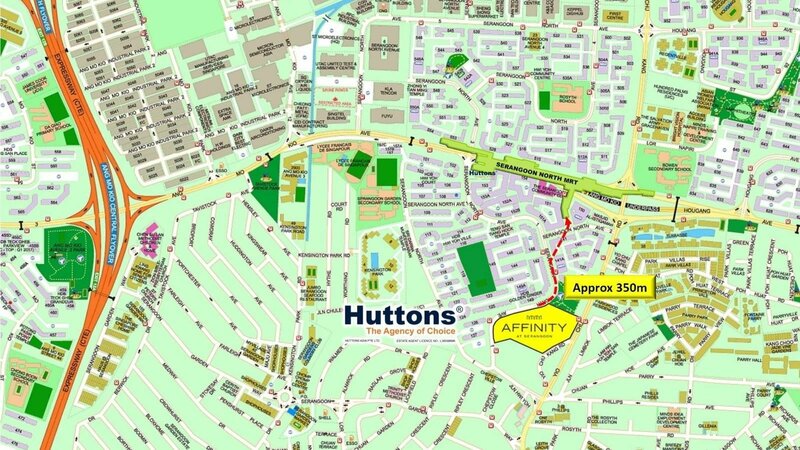 Affinity is easily accessible via Yio Chu Kang Road and the Central Expressway. Getting to town is a matter of ease with the nearby Kovan MRT and Serangoon MRT Stations providing a connection. Apart from this, vehicle owners will benefit from its close proximity to the Central Expressway (CTE), making it well-connected to a comprehensive network of main roads and expressways where they can access easily Tampines Expressway (TPE), the Seletar Expressway (SLE) and the Kallang Paya Lebar Expressway (KPE) to reach the other parts of Singapore.